The Social giant Facebook announced on Friday, it is rolling out new feature called Photo Sync for all iOS and Android users. 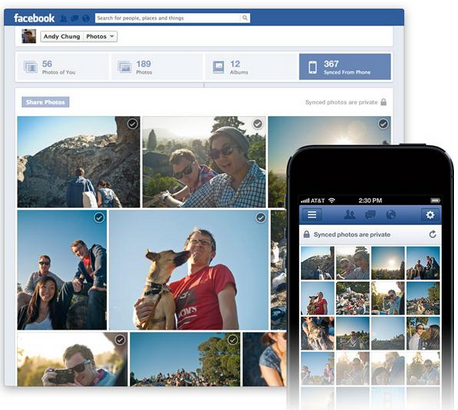 Facebook photo sync features syncs photos from your phone to a facebook private album automatically. After You can easily share your synced photos on your timeline from desktop, mobile, or another device. To use this new feature download the latest version facebook app from following links Android & iOS. If you are using iPhone update your device to iOS 6 and find the below steps to use this new feature. Then Click Synced From Phone at the top of your photos section and follow the step-by-step instructions shows on your window. You can sync up to about 2GB of photos. Decide which photos are synced by deleting some photos. This new feature rolling out to every one gradually, so wait for your turn if it is not available onto your device.